I want to find a back-up blankie for my daughter. In May of 2005 I received a CachCach carry around blankie that has yellow minky cloth with satin on the back. It has a bunny head attached to one corner. The lovey I’m hoping to find has the raised dot minky material, and it came as a gift set with a receiving blanket. The gift was for my son’s birth, but the new baby has become very attached to it, and I’m terrified we will lose it without a backup! If anyone has a lead I would appreciate it. 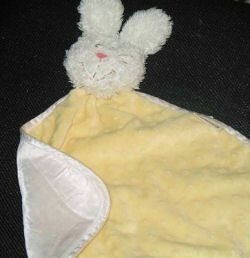 If you can help Lorna find this CachCach Yellow Bunny Blankie, THIS SITE IS NO LONGER ACTIVELY MANAGED. Please use Our FREE FACEBOOK GROUP, including #022808-2 in the subject, .